VW expects more than half of all Up buyers to opt for the five-door version. FRANKFURT -- Volkswagen says it will begin advance sales of a five-door variant of its Up minicar in Germany on March 6, ahead of a rollout to dealers in May. The five-door Up, which will debut at the Geneva auto show in March, will cost 10,325 euros in Germany, 475 euros more than the three-door version. It will be launched in the rest of Europe by the third quarter, VW said. The Up five-door has the same engine range as the three-door, as well as the same trim levels and dimensions, but the rear doors allow easier access for passengers in the back, VW said. As with the three-door version, buyers of the five-door Up can choose between two 1.0-liter gasoline engines that produce either 60 or 75 hp and five trim levels. The five-door Up has the same dimensions as its three-door sibling, but the longer straighter lines of the rear window give it a roomier look. The five-door Up has a few minor styling changes to accommodate the rear doors. On the three-door car, the bottom of the rear quarter window rises to form more of a point near the C pillars, while on the five-door version, it forms a straight line as it connects the B and C pillars and gives the car an overall roomier appearance. VW says the rear doors open wide and offer comfortable entry to the rear seats, which can accommodate two passengers and offer 947mm (37.3 inches) of rear headroom and 789mm (31.1 inches) of legroom. The luggage area has 251 liters of space, which can be increased to nearly 951 liters when the rear seats are folded down. Like the three-door version, the five-door Up is available with optional features that include Volkswagen's City Emergency Braking system, which can apply the brakes automatically when a collision is imminent at speeds of up to 30 kph (18 mph). Also available as an optional extra is VW's maps+more portable navigation and infotainment system. The system features a touchscreen interface, and includes navigation, Bluetooth hands-free phone capability, information display and a media player. 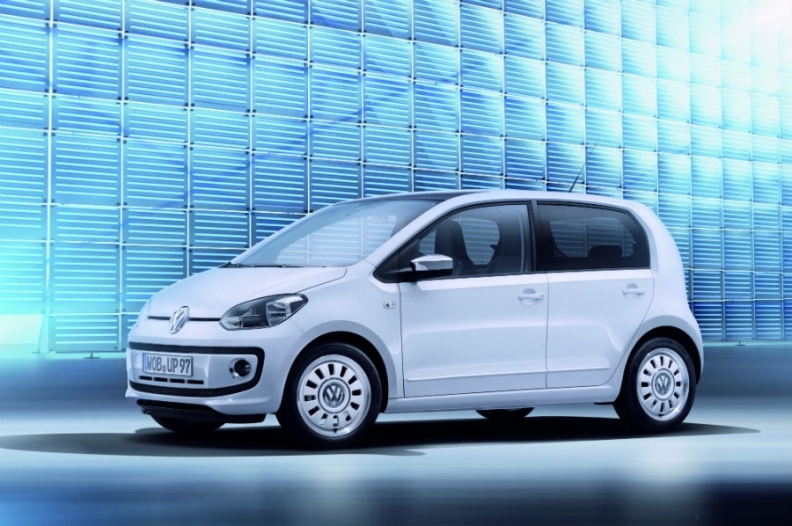 Volkswagen has developed the Up as part of a new family of subcompact vehicles that share a single platform. 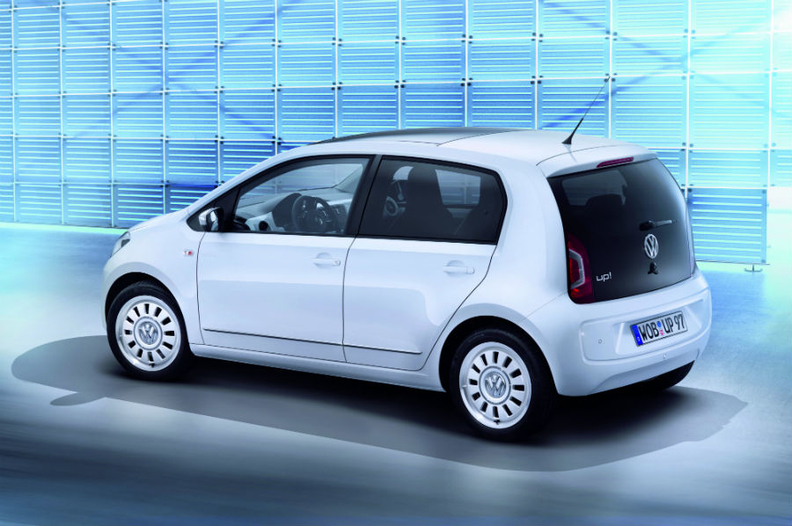 Skoda's version is called the Citigo while Seat has named its version the Mii. Small budget cars such as the Up occupy an increasingly popular segment that has remained relatively unscathed by the recent global economic slowdown and VW hopes that sales of the car will help it hit its goal of becoming the world's largest carmaker by 2018 or sooner. Last year, the Volkswagen Group sold 8.16 million cars, a rise of 11 percent over 2010 figures.